Some clever stick once said that attaching a keyboard to early synthesizers was probably one of the worst things anyone ever did. I think their point was that as an interface, a piano keyboard simply wasn't versatile enough to exploit the creative potential of the new technology. I'm not sure I agree wholeheartedly with that statement — it was probably made by someone resentful of the fact that their band's keyboard player had more musical knowledge in their little finger than all the other members put together. But one belief I would carry a card for is that keyboards and drum sounds don't make for a particularly happy mix. Not only does it seem so much more intuitive to trigger a percussion sound with a percussive action, it's physically a lot easier to get the right kind of dynamics by hitting a surface with a stick or drumming your fingers on a pad than it is to try pressing keys on a keyboard. That's certainly the train of thought that has led to the launch of M-Audio's new Trigger Finger, a USB/MIDI control surface designed primarily for software-based musicians to tap out rhythms and trigger percussion loops. 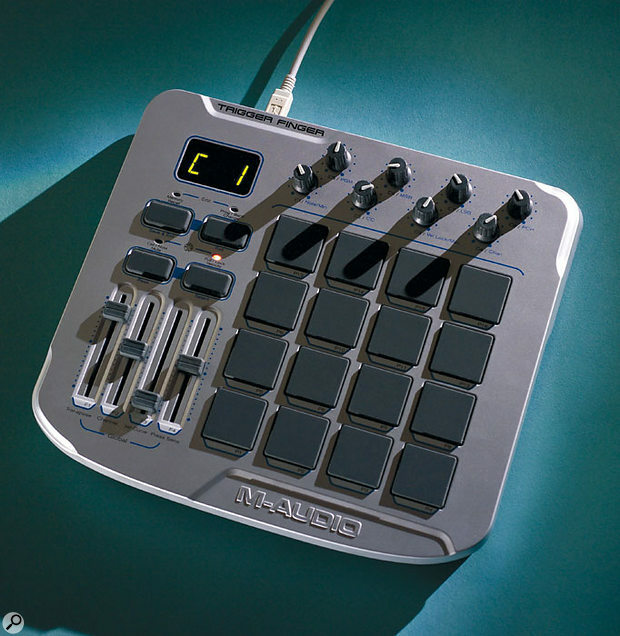 Its main attribute is a four-by-four matrix of finger-sized, velocity sensitive pads — similar to the arrangement you'd find on Akai's MPC range of sampling rhythm workstations. But the Trigger Finger goes much further than just being a set of disembodied drum machine pads. With eight assignable knobs, four sliders and a high degree of overall programmability, it offers the level of general MIDI parameter control that you would normally expect to find on a controller keyboard, potentially making it a very versatile member of any musician's MIDI studio. The first question about Enigma has to be why M-Audio decided to call it that. Editor/Librarian software should ideally take the mystery out of programming a hardware device by allowing you access to all the parameters at a glance, but this name makes it sound as though interacting with the target device is going to be an obscure, difficult experience! Happily, this software belies its name and proves to be exceptionally easy to use. It also really opens up the bonnet of the device and allows you to more easily exploit all of its programming features. Before continuing, I should also make it clear that Enigma doesn't just work with the Trigger Finger; it also supports a range of M-Audio controller devices, specifically the Keystation Pro 88, the MK425C, MK449C, MK461C, the O2, Ozonic, the UC33 and the X-Session. So if you're a proud owner of any one of these, it's worth pointing your browser to www.m-audio.com and downloading it for free now. The included Enigma software allows you to edit and save patches with a simple, one-screen interface. Enigma is available for both Mac and PC. As you can see from the screen shot above, I was testing out the Mac version, but functionally the PC version is the same. 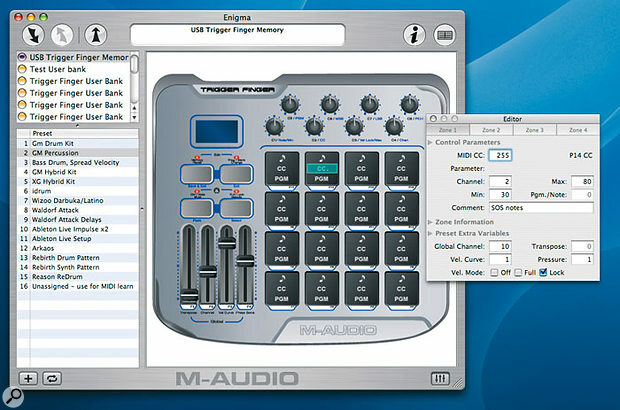 Loading up the main window normally gives you a graphical representation of the Trigger Finger (or indeed any of the other M-Audio devices that the software supports). To the left, a menu pane allows you to switch between devices and/or select various presets for any connected devices for editing. In its initial state, Enigma loads with the Trigger Finger's 16 default factory 'kits' which are a good place to start for creating your own patches. A new user set is easily created by pressing the '+' button, and it's then a simple matter to copy the defaults into these new locations for further tweaking. There are various methods of programming the values for each of the eight knobs, four sliders or 16 drum pads. Generally speaking, it's simply a case of double-clicking on the virtual knob or slider to launch a pop-up Editor menu which gives you access to the available parameters for that particular control. The pads actually have three clickable areas each — for note assignment, continuous controller value and program change number — and clicking on any of these will bring up the appropriate Editor window. The Editor menus also allow access to certain global parameters, such as the Global MIDI channel and the overall Velocity curve settings. Obviously, if you change these values in one window, then they'll apply to all the others. Usefully, each window also has a comments field, so you can write memos to remind yourself what you were trying to do. Apart from entering values via the Editor menu, you can also drag and drop MIDI note numbers and/or controller values or parameters from the menu which, in the Mac version, slides out on the right of the main window. Simply pop them on top of the desired button or slider and they are assigned. The right-hand menu offers an extensive range of controller 'libraries'. Some are generic (such as General MIDI, GM2, XG/GS and MIDI Machine Control messages), but many are dedicated to specific software synths, samplers, effects and the like. This can be a very painless way of setting up the Trigger Finger's knobs and sliders to control elements of your software studio. Transferring patches between computer and the Trigger Finger is then a simple matter of hitting the Upload or Download buttons as appropriate. It's all very slick, and so much more transparent than trying to program the unit from its own control surface. Which explains why the manual encourages you to use Enigma if at all you can — advice which I would recommend you follow. Physically, the unit is a neat, chunky thing, smartly presented in today's essential colour — silver. Although the casing is plastic, it seems pretty robust and feels as though it would be well able to stand up to a life on the Highway Of Rock. For that purpose, you'll find a threaded socket on the back panel which will allow you to mount it on a mic stand, though it probably works better sitting squarely on something which supports its entire surface area. Along with the Trigger Finger itself, the box contains a multi-lingual Quick Start guide, a six-foot USB cable and two CD-ROMs. One of the CDs contains a much more detailed User Guide in PDF format, plus Editor/Librarian software (see the box above). There's also a copy of Live Lite 4 on the second CD-ROM (a cut-down version of Ableton's rather nifty sequencing software), which allows you put the Trigger Finger through its paces straight away. If you're running Windows XP or Mac OS 10.2 or above, then interfacing the Trigger Finger with your computer is a straightforward plug-and-play experience — just connect the USB cable and away you go. The snag is that Windows will only support the use of USB devices like this with one music program at a time. So if you want to use the Trigger Finger across several applications running simultaneously (and most people will), it's a question of taking a three-minute detour to install the included multi-client driver. Job done. Normally, the Trigger Finger is powered from the USB connection too. But if you have too many USB devices hanging off your hub already, or if you have a spare mains socket that you want to fill up (who am I trying to kid?) then you can always resort to an optional 9V wall-wart adaptor. 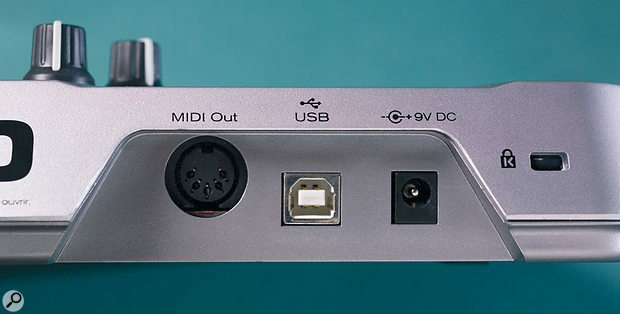 Of course, such an adaptor will become a necessity if you want to hook up the Trigger Finger via its MIDI Out — for example, if you're using a different operating system to the ones mentioned above, or if you're connecting it directly to another piece of MIDI hardware, such as a synth or sampler, without going via a computer. M-Audio have crammed an awful lot of functionality into the Trigger Finger and the three-segment LCD leads a hectic life telling you all about what's going on. For example, in Performance mode, the display normally tells you the number of the currently selected kit. When you hit a pad, the LCD briefly displays the velocity value and then shows you the name of the note assigned to that pad. This is quite useful when you are just checking which note number is assigned to which pad, but once you start playing more complex rhythms, the resultant lightshow becomes a little bit distracting. Definitely of real practical use though is the fact that as soon as you move a knob or slider, the LCD gives a readout of its value. What's more the Trigger Finger also offers a Control Mute function, allowing you to move knobs and sliders to new positions without actually transmitting the corresponding MIDI data. You still see the changing value though, which means you can precisely match the controls to a software or hardware instrument without causing jumps in the sound. For good measure the Trigger Finger also offers a Note Mute function, whereby the pads stop transmitting notes but continue to transmit controller values as do the knobs and sliders. The thinking behind this function is to make it easier to interface with software or hardware that has a MIDI Learn function, so that you're not confusing things by transmitting note information every time you hit a pad. Once power is supplied, by whatever means, the Trigger Finger's triple LCD springs to life and you're ready for the off. As it arrives from the factory, the unit's 16 patch memories are already filled with templates of note and controller assignments designed to work with typical setups. So there are templates for using the Trigger Finger with GM and XG Drum sound sets and for popular software packages (or at least popular software packages as distributed by M-Audio) notably Reason, iDrum and Ableton Live. While this is approach is meant to take the sweat out of getting down to some serious tapping as fast as possible, in practice you'll probably need to shift straight into Edit mode to start integrating the Trigger Finger into your specific setup. It's as you start to work on your own patches that you begin to appreciate the degree of programmability on offer. For example, the pads can transmit note data on one channel and program and bank change information on another. As well as being velocity sensitive, they are also pressure sensitive, enabling you to send programmable MIDI controller information based on how hard you press them down. It's similar to aftertouch on a keyboard and offers some very creative possibilities. For example, you can create more realistic-sounding tablas or African drums by using pressure to transmit pitch bend. You can also set up the pads so that crash cymbals 'choke' (the sound cuts off) when the pad is pressed down. Also you could assign some pads as controls to affect a whole kit globally. So while you might tap out rhythms by playing a set of pads with one set of fingers, you can use the fingers on the other hand to press down on other pads to change overall volume, pan position, pitch, effect levels and so on. The Trigger Finger offers a number of options to take this kind of control a bit further. Programmable Maximum and Minimum values allow you to set the upper and lower range of the pad's pressure controls, even enabling you to invert the pad's response under pressure — so pressing harder sends a lower CC value than pressing lightly. This Max/Min feature is also found on the knobs and sliders, which in Performance mode are normally used to send continuous controller data to the target software or hardware. Again, like the pads, each control can transmit on its own MIDI channel, or it can use the channel that has been globally set for the unit. As I've already mentioned, the 16 drum pads are velocity sensitive with global programmability of their responsiveness set via nine predefined velocity curves. There are also three fixed velocity options that set the velocity of all pads to values of 64, 100 or 127 respectively. At the touch of a dedicated button, the Trigger Finger also adopts one of two other velocity modes: Full and Locked. Activating Full Velocity means that all the pads will transmit notes at the maximum fixed velocity of 127, regardless of how hard you actually tap the pads. Locked Velocity, on the other hand, means that each pad will transmit a specific velocity value, which can be programmed as part of an individual pad setup. This feature is great; by way of example, it can be used to set up the Trigger Finger so that you have an ascending spread of velocities across all of the 16 pads, for precise programming of a single drum sound. In Edit mode, the knobs and sliders become the means by which you program the Trigger Finger itself. In this state they become automatically 'hard-wired' to specific parameters: for example, knob 1 controls the programmed note value for the selected control while slider two becomes responsible for setting its MIDI channel value. The principle of the system is pretty straightforward, though in general it can get a bit confusing as to what exactly you're editing — a three-digit LCD is not the most intuitive of feedback mechanisms. Fortunately, there's a much more user-friendly alternative in the form of M-Audio's Enigma Editor/Librarian (see the box on the previous page), which not only gives you a better idea of what's going on visually, but also gives you control over several more parameters than the hardware interface allows. There are lots of musicians I know who would claim they couldn't play the drums to save their lives, but they can tap out a rhythm on a table top with no problems. The Trigger Finger is ideal for this kind of purpose — it makes programming rhythms into sequencers generally faster and more intuitive. But with the bonus of pressure sensitivity on the pads, plus the added knobs and sliders, it really should be seen as more than just a tool for beat junkies. In fact, it's probably nearer the mark to think of the Trigger Finger like a controller keyboard, only with pads instead of keys. Probably the only feature I'd like to see added is the ability to create layered sounds by being able to assign more than one note number to a pad, and then setting up a velocity crossfade between the sounds. 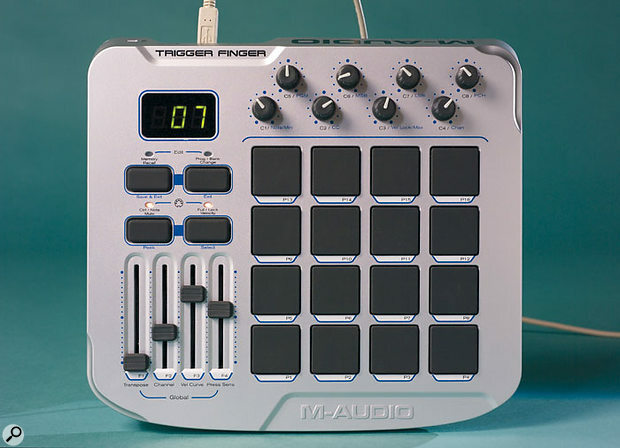 But as it stands, the Trigger Finger would prove a versatile addition to any MIDI studio. And at this price, nobody needs much of an excuse to give one a home. The programmability makes the Trigger Finger far more than just a set of drum pads in a box. Pressure sensitivity offers creative possibilities. There could be more onboard memories. Unwieldy to program without Enigma. Even if you don't think of yourself as a beat-based musician, the Trigger Finger is worth checking out, as it offers a different way of interfacing with your sounds. M-Audio UK +44 (0)1923 204010.